The reaction towards protesters was overwhelmingly positive by both attendees of the brunch as well as those passing by during the course of the rally. In addition to giving an enthusiastic thumbs-up while driving into the parking lot, several of those attending the brunch walked over to to voice their support and to thank Bay Area Intactivists for being there. Some were shocked to learn that the ACLU has had such a poor track record in regard to ending the forced genital cutting of boys. However, the Pro-Choice Brunch Keynote Speaker and ACLU of Northern California Reproductive Justice Policy Director Phyllida Burlingame was less than enthusiastic about the presence of Bay Area Intactivists. She spent a few minutes at the start of her talk to defend the ACLU's position in regard to male circumcision but made no attempt to have a discussion with the protesters. 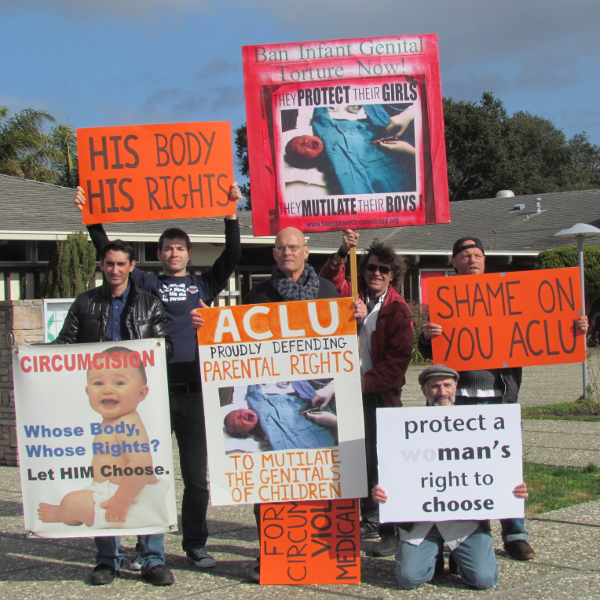 Although Ms. Burlingame was unwilling to have an open dialogue to address the inequality and hypocrisy of the ACLU's current stance on forced, non-therapeutic genital cutting, Bay Area Intactivists members left the event rejuvenated by the tremendous support displayed towards them by the community. Good for you! I am so glad you got positive reactions from the public and attendees. Was there any media coverage? Do you oppose the ACLU's efforts to keep abortion legal? The pro-life/pro-choice debate is outside of the scope of Bay Area Intactivists. This aim of this group is to protect male, female, and intersex individuals from being forcefully subjected to non-therapeutic genital surgery.